Everyone, even people who opposed him, understand that the election of Jeremy Corbyn as Labour leader was a signal of a deep desire for change among Labour members and supporters. I have never agreed with all Jeremy Corbyn’s views but I was pleased to vote for him and, on reflection, I am glad that I did so. After all, the alternatives promised at best no change to Labour’s received wisdom about “electability” (Burnham and Cooper) or even a regression to undiluted Blairism (Kendall). Corbyn’s election announced the possibility (but little more than that) of a new path for Labour. One of the keys to that new path was to be the full involvement of the mass of party members in policy formation. The view that Party members were to be regarded as a resource rather than something to be manipulated to get support for policies decided in advance was something of a breath of fresh air. But there is an immense distance between wishing for better democracy and making it a reality. That is especially true of a long established institution like the Labour Party. It is a big ship with its procedures, elected representatives and full-time officials and various traditions. Turning such a ship round was never going to be an easy task. I am reminded of a scene in John Reed’s Ten Days that Shook the World in which he describes a vote in the Petrograd Soviet. The majority support a motion. Votes against are called and a few hands are raised. Reed describes a surge of bodies around the nay sayers resulting in their contrary votes disappearing. As I remember it, Reed seems to regard such things as either amusing or as showing the virility of the revolutionary movement. I found the description repellent and a characteristic of the mindset which allowed the dreadful weed of dogmatic “Marxism” to stifle the creative thought released by the 1918 revolution. We are nearly a hundred years on from those events but, it seems to me, have still not absorbed the lessons on how to handle divergent views without abuse. Corbyn and McDonnell have a very hard task to turn the Labour ship round to point in the direction of a democratic and socialist future (i.e. in the direction of its declared objectives). They face immense opposition throughout Labour’s established structures. Their position can only be secured by winning a whole series of battles about the ideas underlying Labour’s raison d’être. This is a battle that cannot be won by two, or even a handful, of people at the top of the structure. Neither can it be won by a small groups of people at the head of organisations trying to advance a left agenda, however worthy their motives. If the left is to make headway and to provide Corbyn and McDonnell with the support that they need to consolidate their positions, then we need genuine debates going right down to Labour branches about what Labour stands for. But if we are to overcome Plato’s problem of the populism versus expert opinion then the answer has to be by treating members as adults who can listen carefully to the arguments on the various sides of each debate and then make up their own minds before lending their support to any particular view. Such a process is inconceivable without carefully prepared documents for the various contending views so that members can discuss and weigh the alternatives. This is what was completely missing from the so-called policy review under Jon Cruddas and is the reason why it was such a farce. At this point, in asking for such an adult debate about alternatives, I worry about the political habits of so many of those on both the left and the right who have spent their lives drawing up election slates, circulating motions only ever seen by a tiny minority of members. The smoking ban may have made “smoke-filled rooms” a thing of the past (I hope so at least) but the spirit of those rooms lives on without the smoke. Genuine informed debate, rather than different camps jockeying for position and trying to get “their people” onto this or that committee, is just not a part of Labour’s traditions. That needs to change and change in a short timespan. I don’t think that, with a will, it would be that difficult to bring about. What is needed is the understanding that it is what we must do if Labour’s left turn is to be put on a solid basis. Branches need to receive position papers, produced according to agreed guidelines, with a request to members to discuss them and to express their views about the alternatives in motions to their constituency parties for Labour’s national policy forum. According to the situation this or that group may find a resolution reached on such a democratic basis unacceptable but that is for them to decide. For thearty there is, in my view, no other way forward. I am at something of a loss as to why there are not already clear moves to institute such informed debate. I will begin by stating I agree with your conclusion, the party needs debate to decide where it is going. I also agree with the notion that we need to decide what constitutes democracy in the party and then to use it to have the debate to decide our future. In my view this needs to include large layers of members because the cliques and old layers still dominate many CLP’s, but more of that soon. However, I am less elitist than you appear to be and I am less concerned than you about ‘populism’ and the direction members would take the party. In opposition to your “experts” or, to finish your Plato analogy, philosopher kings, I would give the membership its head or we end up with the very thing you were criticising, top down policy. I guess you’d be happy with that though as long as the right philosopher kings were in place. Interesting Plato was was the analogy you picked whilst deriding populism, promoting experts and reacting as you did to the workers Read described in ten days. It is perspectives like that which led to the Stalinism that throttled the creativity of the revolution in 1917 you bemoaned (I am not intending to rewrite the thesis of Revolution Betrayed). The workers know what they want and need, trust them. They invented trade unions and the Labour Party so they have every right to be trusted. To my wish list. I was inspired by the huge crowds Corbyn spoke to during his campaign and I would like to see similar things again. I would love to see a string of regional conferences and the adoption of policies by them leading up to a national conference. The leadership could be present at each conference and factions would have every opportunity to make their case and not in back rooms. This would engage the widest number of members as each CLP could send many delegates, as many as a local venue could hold and the real mood and wishes of the party coul be heard. Looking at Corbyn back in August I think we’d be turning people away if we charged for spare seats. I probably did not explain myself clearly enough. I am certainly not advocating a rule of experts. My point was that Plato’s arguments against democracy had, and have, some force. That is simply because democracy as such is not a panacea. The way out of the dilemma is informed democracy in which people choose on the basis of a good understanding of the alternatives. I hope it is clearly that I am advocating widespread debate on all fundamentals in the Labour Party but that I think that the quality of that debate has to be far better than anything Labour has attempted in the past and certainly it has to be better than the so-called Policy Review run by Jon Cruddas which did not recognise the most basic ideas of informed debate. Experts are needed but it is up to them to explain themselves to the members in a way that makes their expertise genuinely available to others. Ultimately it is the members who must decide. I replied to you earlier but my response seems to have got lost in the electronic ether. Perhaps I hit the wrong button. Perhaps I didn’t explain myself clearly enough. I certainly never intended to advocate the rule of experts. My point was that Plato’s criticisms of democracy had, and have, some force. Democracy driven by focus groups and a soundbite culture suffers from the problems that Plato criticised so clearly. The solution to the conundrum of democracy or rule by experts has to be that the majority become well informed and understand the main contending arguments. That is, of course, a very big ask but it is one on which I think we should set our sites – starting with the members of the Labour Party. We need experts, not to rule us, but to explain what they know/believe in terms that can be grasped by non-experts keen to understand the problems. That should inform the materials prepared for Party members. A local councillor told me the other day that our LP branch meetings have become vastly more worthwhile and interesting since we started having regular debates lead by members who have researched a topic of their choice. We have had papers circulated before meetings and really good discussions at the meetings. This is surely the way to go. I agree with much of the main thrust of argument of the main article and the first contributor. A synthesis of the two helps me appreciate the need for more engagement both in discussion but also in political activity and the engagement beyond committees. The motivations and orientations of people involve intellectual, emotional and behavioural aspects. I was involved in some early door to door campaign work recently alongside someone who had returned to the Labour Party and political work, but to my surprise it was not (consciously) Corbyn that brought him back. My assessment was that it was emotional loyalty bourne out a lifetime of past experiences. Plato’s view of humans and democracy was as an intellectual engagement, however not everyone is stimulated, motivated or operates primarily at that level. Learning and understanding does not just emerge from intellectual debate but by a combination with experiences across a range of political engagement. Thank goodness, since working people have limited opportunities for the mind expanding exposures. Some CLPs survive on ‘blind’ loyalty and learned behaviours by some. The challenge is to find ways of integrating the critical and emotional components of support. In my opinion both a massive leverage of regional conferences (with challenging debate) combined with programmatic expressions of political activities could promote the changes we need to Labour Party/Supporters that will make the Corbyn leadership and the changes we need to invigorate branches. I agree about blind loyalty. In the debates that we need it is only loyalty to finding the best ideas that is appropriate. The tendency to support or oppose an idea because it is seen as emblematic of the left or right has to be put to one side. The issue here is actually quite simple. Jeremy wants to return policy making and ownership of it back to the members by restoring the sovereignty of Conference. The ‘moderate’ wreckers want to stop him and retain power with the PLP now they have lost it with the Party leader. The problem we currently have, and that Jeremy is obviously wrestling with, is that until we get a return of internal democracy and a return of democratic policy making that was virtually destroyed by Blair, then he is between a rock and a hard place as the squeals of the right wing in the PLP on any progressive policy statement or idea from him of John McDonnell shows. It is a period of transition that is both messy and damaging due to the image the right wing portray of it in the media, but it is a transition that must take place, as must the stop-gap of things like trying to put more power in the hands of the NEC rather than the PLP which is a good start at least, not least because the NEC at least contains some influence from the union affiliates which may be a problem in relation to Trident is again something that is necessary in restoring Party democracy. I can agree that the issue is simple: members should decide. However with decision making comes a responsibility to decide on good grounds and not on prejudice or group loyalty. Organising debate which really gets to the root of the issues with the main contending ideas clearly represented is not so simple, especially since it is something that Labour has never attempted. The Third Way was something that could be done to the class and it was with knobs on. Anti-austerity on the other hand requires mass mobilisation and a mass movement which means a programme for said has to be developed by the Corbyn leadership or the enthusiasm that got it elected will quickly be dissipated. Trips to Calais not only get in the way of that task but are part of the process of dissipation. A ridiculous substitute for genuine radicalism that merely angers and alienates. Who is talking about a “third way”? A very good piece by David and I agree with most of this and have been arguing for similar things for over a year as a left wing democratic socialist who voted Corbyn but I too don’t agree with JC 100% on everything but at least he is in tune with power for members and grassroots, bottom up democracy. But some of the Left at the top may have had a lifetime of organising and promoting Left slates (as the Right does around their perspective). Having ideas as a stimulus -response can be quite exciting and widening ideas to sympathetic people may add to the process, instead of being precious, believing we have the perfect policy. In my view the Policy Forums were a waste of time and were just a fig-leaf for top down Labour leaders to subsequently ignore. We perhaps do need expert groups in the broadest sense which may include academics but also experts by experience. Take housing for example – we do need a stimulus – response paper for branches/CLPs/Trade Unions/Affiliated societies but I would argue they should ideally be one side of A4 and written simply and the more innovative CLPs etc. could open up a meeting to Labour supporters and those interested in housing to discuss. But we also need on-line contributions because some people can’t make meetings (caring roles, childcare, work commitments etc) – we need to offer every member a voice. Then let democracy decide OMOV. But perhaps we need to think how we nominate people and for example what if I as a left wing democratic socialist wanted to stand for the NEC?Would I be up against the Lefts’ favourite sons and daughters (who I love and vote for)but where are the fresh ideas? But the right is organising and as well as ideas we need to organise too for left wing democratic socialists as Conference delegates, NEC candidates, left wing democratic socialist resolutions to Conference getting power back to members, and left wing democratic socialist MPs. But at meetings instead of nominating Conerence delegates why not ask who would like to go and then let each tell us their ideas and why they want to go then vote for the one we want. For the NEC could the Left/Momentum ask for interested brothers and sisters to send a statement on why they want to be on the NEC then let everyone vote on the slate. For Parliamentary candidates why not ask interested members to put their names and ideas for free on a CLP website 2 years before selections and then let the CLP draw up a shortlist of 6 to speak (which should incluse at least 2 working class, 2 women and at least 1 BME/Disabled/LGBT) but if members are happy with a sitting MP then if 51% support this then they don’t have to follow this process. Ideas, opening up ideas, listening, democracy, evidence, experience, as well as organising and working with international partners and we may build a better World. I agree with your points and I think that the use of the Internet is a big issue not yet taken seriously by the Labour Party. Footnote picking Confrence delegates – statements of those interested could be put on the CLP website (or paper copies requested as not everyone has access to a computer) and voting could be also done by post or on-line. Equally picking a shortlist for a Parliamentary candidate – info posted on-line and voting by post and on-line. I really like this article. It is something that I have thought about for a long time. I feel that conundrum between democracy and expert opinion could be solved by at least attempting to try an educate people as much as possible so that they make informed choices. My interest is economics, because I think it is key to encouraging people to vote for the left. My belief is that the left have won the intellectual argument with regard to trickle down economics, the evidence is clear to me that it caused the financial crisis, caused gross inequalities, poverty and even corruption. Jeremy Corbyn, along with other worthy left wing MPs, including one honourable member who used to write here, always criticised neoliberalism/Thatcherism, and the Blairite consensus with it. But listening to the right wing press you would thing that a Premiership of Jeremy Corbyn would be the beginning of Armageddon, instead of the Keynesian stimulus that his policies represent. He would make changes so badly needed by the poor and middle class, regarding jobs, housing, the NHS. This view can be changed by education, but I think we need to circumvent the hostile right wing press by having locally organised educational activities. Where I live, the momentum group has organised a talk by Ha Yoon Chang, an economist critical of the mainstream. I hope we do a lot more – I am sure that it is one of the answers. I meant to leave a link to John McDonnells seminars also. Whilst education is important it needs to lead to learning and understanding. Not all intellectual activities, i.e. debate, will lead to learning and understanding. Who does the educating and who participates in the discussions? Surely the answer has to be people engaged in political activities (of the Left), otherwise we will be left with some of the sterile debates that can from time to time appear (on some websites). Such debates may be a partial explanation for why some working people become alienated from political discussions. I agree. The old slogan was “educate, agitate, organise”. The educate bit is what we now have to take really seriously. If we try to fight a war of sound bites on the economy we will lose. We need understanding which cannot be promoted in this way. An interesting and in it’s own way a timeless article; Plato’s, (and not just Plato’s,) problem of the populism versus expert opinion is almost old as human society. Similarly, (as another example,) the famous Lincoln–Douglas Debates; The debates in Freeport, Quincy and Alton drew especially large numbers of people from neighboring states, as the issue of slavery was of monumental importance to citizens across the nation. Newspaper coverage of the debates was intense. Major papers from Chicago sent stenographers to create complete texts of each debate, which newspapers across the United States REPRINTED IN FULL, with some partisan edits according to their bias. Contrast all the above with the inane sounbites, (that even without the current widespread media censorship,) of the SUN, twitter or off a 30 slot on the news at 10, to market, (rather than argue,) a point and the contrast is shocking. Nonetheless I still agree with Churchill, that indeed; “Democracy is the absolute worst political system; apart from all the others,” something we seem to be forgetting as the kind if serious and informed debate that you advocate becomes lost in a miasma of gimmickry and trivial and this is perhaps a far deeper and more fundamental difficulty with democracy than you indicate. Education is another key; and for the record I am not a graduate, nor a political activist and attended a local comprehensive and Collage of F.E. with unspectacular, (but sill perfectly adequate,) success. I seem to recall that it was actually Phillip II of Macedon, Alexander’s dad who conquered Athens, but the point stands. Nor have any of us forgotten that Blair or Straw, (same difference,) had an 87 year old man; Walter Wolfgang removed and detained under the anti terrorism laws for quite rightly and accurately calling Jack Straw a liar and fraud and the message it sent was just how deeply and how profoundly the bunch of crooks, (certainly in my opinion,) who have, “captured,” the PLP fear and despise free speech and open debate; as traditionally it has been practiced here in the UK. Your point that democracy by itself is not the answer is one I agree with. It has to be democracy with understanding which part of a process by which society educates itself. This has also started me thinking about politics as a part of general education in school. Difficult territory but I think it is something which the left should start to take seriously. But even Democracy itself has become a very slippery term; to often misused to support the prejudices the speaker and it’s worth remembering that in Athenian democracy elevation to public office was based entirely selection by lottery, had almost no public officials or bureaucrats and a vote was taken on almost everything with debate lasting no longer than a single day. Their [Corbyn and McDonnell’s] position can only be secured by winning a whole series of battles about the ideas underlying Labour’s raison d’être. This is a battle that cannot be won by two, or even a handful, of people at the top of the structure. Neither can it be won by a small groups of people at the head of organisations trying to advance a left agenda, however worthy their motives. If the left is to make headway and to provide Corbyn and McDonnell with the support that they need to consolidate their positions, then we need genuine debates going right down to Labour branches about what Labour stands for. Also, just as I don’t believe that democracy without qualification is the answer neither to I believe that the answer is education without qualification. We need democracy which is based on a real understanding of the contending arguments. We need education which is is based on the view that understanding is deepest when it is based on active involvement. From what you say I don’t think there is any real difference between us on these issues. P.S. I may or may not have missed the point but I find the idea that I did so “because” I was a teacher rather strange. Do you have a reason for suggesting that? Just as a point of consideration. Do not affiliated trade unions have a reasonable expectation based upon the historical relationship, and last hundred years of convention, for there to be private discussions about policy between the unions and the party? Is t not also the case that affiliated union have their own decision making processes and structures, and David’s prescriptions for CLPs debating and deciding policy would need to accommodate to that, in some way. Yes, I accept that my proposal for informed debate should extend beyond CLP to affiliated organisations. I don’t really understand the point about the need for private discussions about policy. I think we have, in the past, had rather to many of them. The problem for union affiliates is that they, even less than the Labour Party, have a tradition of informed debate. An indication of the low base of debate for many unions was given by Len McCluskey’s recent defence of Trident renewal purely on the basis that Unite members jobs were at stake. There was not even a hint of discussion of transfer of technology or creation of new industries to replace armament manufacture. So they are open to a discussion of commitments for alternatives. It is a misrepresenttaion that Unite did not have “even a hint of discussion”. ii) As Unite’s policy is for the preservation of the status quo until there are firm alternative employment options committed to, it is a defencible decision that it is not for Unite but for those seeking to change the status quo to initiate a debate about those alternatives. Because the Labour Party is comprised of a number of different institutional constituencies, the most important of which, historically and currently, have been the PLP and the unions. Clearly as those institutions have different and parallel decision making processes, and represent overlapping but not identical institutional interests and social bases. Such differences might need to be explored privately t choreograph a win-win outcome. Also, there are different levels of commitment to policy, such that a union (or indeed the party) might take a stand on an issue, but in Jack Jones’s words, there might “be no army behind it”. Other issues might be ones that you would die in a ditch to defend. Anyone who has ever negotiated will also know that you might want to present a more nuanced position privately than you do publicly, and that different constituencies are being addressed. Undoubtedly the current policy making regime in the party is top heavy, unresponsive and undemocratic. However, any proposed changes to redress that need to understand that the unions cannot accept changes that would allow them to be steam-rollered by the constituency membership, when the unions are potentially natural allies of those seeking a more radical agenda for Labour. Mark Mardell. None of that is made any easier by the continuing rows, deep divisions within the Party and one symbol of that, one issue is Trident. What’s your union saying about Trident? Mark Mardell. Are you delighted that Ken Livingstone is no longer there with her? Len McClusky. I’m delighted that there’s been a clarity – let’s put it that way. Again the media would like to think that that Ken has been slapped down. I don’t think anyone has been slapped down. I think there is just a clarity about how it’s going to be conducted. Unite will participate in that and of course we’ll be making a very strong case for the defence of our members jobs. But remember this, this year the government will put a proposition, a main-gate proposition, on Trident and the renewal of Trident submarines to Parliament and it will go through Parliament. What Jeremy does, obviously he’ll have to make a decision. I would think he’s probably going to give a free vote. Mark Mardell. You would endorse that, that would be the right thing to do. Len McClusky. I think it’s a sensible way of moving forward. That way those with strong convictions on both sides will be able to vote accordingly but either way this policy is going through, contracts are going to be signed, submarines which take five years to build, and there’s four of them, will start to be built in Barrow and we’ll all move on. Mark Mardell. Trident is a huge geo-political issue, for many it’s a very big moral issue as well. Isn’t it narrow just to talk about jobs, particularly when Jeremy Corbyn said, he will … he’s written a long piece about how he would diversify if Britain went unilateral. Len McClusky. Yeah, you’re right, it is a moral issue. But we shouldn’t dismiss moral issues when they have practical implications. If I was to take you up to Barrow and you were to ask people about the moral nature of this debate, well there’s a morality in turning a beautiful area like Barrow into ghost towns and making tens of thousands of families … giving them no future. That’s not what Unite is about. Mark Mardell. 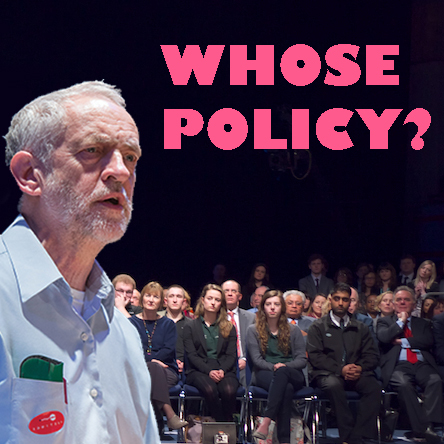 Would you continue to fund a Labour Party that became a unilateralist party? Len McClusky. Well it’s not a question of a unilateralist party. Mark Mardell. And if it did become that? It may do. Len McClusky. The fact is, the fact is that we have to wait to see what comes out of the Defence Review. Our members jobs and our members communities can rest easy in their bed tonight. They’ll be worried because of all this media speculation but we will defend their jobs and their communities whilst at the same time engaging in a mature debate with our Party on he future defence of our realm. P.S. You say “unions are potentially natural allies of those seeking a more radical agenda for Labour”. I find “potentially natural allies” a somewhat slippery notion – especially given the historical role of the unions in backing the right-wing leadership of Labour. I accept that my proposal for informed debate should extend beyond CLP to affiliated organisations. I find such an exclusion of the possibility of criticism both absurd and objectionable.